SHREVEPORT, LA (KSLA) - A clear night ahead means temperatures will tumble quickly. Lows tonight in Shreveport will be around 42 degrees. Areas I-20 and southward will stay in the low to mid 40s. As you go northward, some may see temperatures in the upper 30s overnight and into tomorrow. 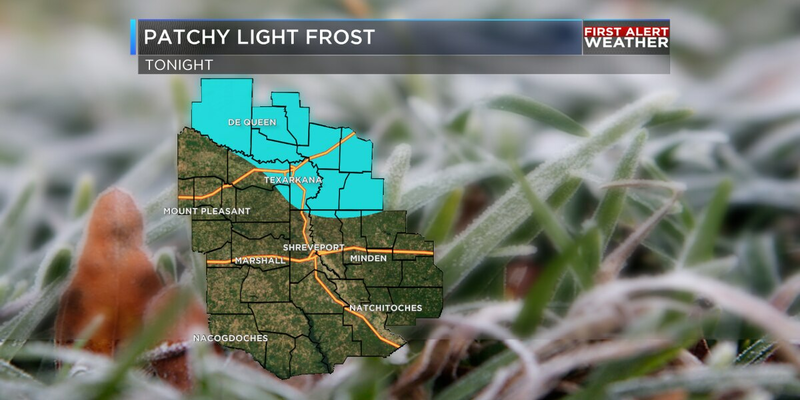 This is the coldest air to move into the ArkLaTex this season. Because of the clear conditions, extra moisture leftover from rain, and light winds; some areas could see light, patchy fog. Southeastern Oklahoma and counties in southwestern Arkansas have the highest chance. If you have sensitive plants, make sure you bring them inside or cover them just in case. Planning your day tomorrow, you will need to grab the heavier coat out the door with the cold temperatures. Maybe bring a hot drink with you as well. We will have plenty of sunshine throughout the day, so don’t forget the sunglasses. Temperatures will be in the low 60s by lunchtime and highs will top out in the mid to upper 60s. The KSLA First Alert Weather Team will continue to be your First Alert on the potential for rain that could impact your Friday evening and Saturday morning.